ONEhalf20 Melt Pressure Gauges are totally mechanical devices offering ease of installation and maintenance. ONEhalf20 Melt Pressure Gauges are ideally suited to extrusion processors who require a reliable and accurate visual indication of melt pressure. ONEhalf20 Melt Pressure Gauges are available in two unique styles. The CTG style features a 6" rigid stem and 30" of flex capillary. The RTG style has only a 6" rigid stem. An optional temperature measurement is also available. ONEhalf20 also offers these mechanical melt pressure gauges with optional 3.3 mV/Volt transducer output, or 4-20mA or 0 - 10 Vdc transmitter outputs. 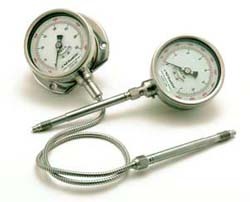 These unique melt pressure gauges feature the standard Bendix style 6 pin bayonet connector and are ideal for extrusion processors looking for localized visual indication at the extruder barrel along with a transducer or transmitter output.